Carciofi alla giudia, or Jewish-style artichokes, are one of the signature dishes of Roman Jewish cooking and a very popular dish in Rome. I have rarely seen this dish in Italian restaurants in the US, perhaps because it is a bit tricky to make, or because of the quality of artichokes here—it is a dish that relies almost entirely on the taste of the actual artichoke—there’s no way to dress it up with other ingredients to make it taste better. As the artichoke softens, place it ‘face down’ in the oil, little by little pressing it down until it spreads out almost flat and the artichoke is tender. To check for tenderness, pierce the artichoke at its thickest point with a paring knife. If you can remove the knife from the artichoke without picking it up, it should be done. Now, just before serving, comes the tricky part: dip you hang in lukewarm water and sprinkle it into the frying pan to provoke a splattering, covering the frying pan very quickly to prevent the oil from splattering all over the stovetop (and the cook!) When things have died down, you’re done. The result is a lovely open “flower” whose taste is indescribable and whose texture is an amazing mixture of crispy and soft. If you are ever in Rome, the place to eat carciofi alla giudia is an area referred to as the “Ghetto”, which had traditionally been the Jewish section of town. (I lived right next to the Ghetto for the first six years or so of our time in Rome, in small square named piazza San Paolo alla Regola.) There are a number of places that specialize in Roman Jewish cooking, which has a long history—Jews have lived in Rome for over 2000 years, since the days of the Empire. It is an interesting cuisine. It can be hard to get good artichokes in the US. Try to find ones that have leaves still tightly bound together. If the artichoke leaves are open and spottled, then don’t buy it, it’s too old. Unfortunately, that describes about 90% of the artichokes you’ll find in the supermarkets here, at least outside California. Besides carciofi alla giudia, there are other great ways to enjoy Italian-style artichokes, like carciofi alla romana, the other signature Roman artichoke dish, or cut into wedges and deep fried. If you are lucky enough to find really fresh, baby artichokes, they are lovely cut into thin slices and eaten raw in pinzimonio—dipped in olive oil seasoned with salt and pepper. As the artichoke softens, place it 'face down' in the oil, little by little pressing it down until it spreads out almost flat and the artichoke is tender. To check for tenderness, pierce the artichoke at its thickest point with a paring knife. If you can remove the knife from the artichoke without picking it up, it should be done. Now, just before serving, comes the tricky part: dip you hang in lukewarm water and sprinkle it into the frying pan to provoke a splattering, covering the frying pan very quickly to prevent the oil from splattering all over the stovetop (and the cook!) When things have died down, you're done. The result is a lovely open "flower" whose taste is indescribable and whose texture is an amazing mixture of crispy and soft. I remember the recipe from Marcella’s “Classic Italian Cookbook”. First the chokes were soaked in lemon juice, drained, stuffed with breadcrumbs and pecorino and herbs; then they were browned in oil, and finally placed upside down in a large pot, with some water to prevent burning. Wet paper towels were placed over the top of the pot, and the artichokes were steamed to perfection. Absolute heaven! I love carciofi alla giudea too, but almost never make them at home. I guess that’s because it’s so easy to me to head over to the Ghetto. I love Sora Margherita too, as well as Gigetto. The way that the artichokes are made in restaurants though, is a bit different. They deep fry them, in pretty hot oil, in two stages. 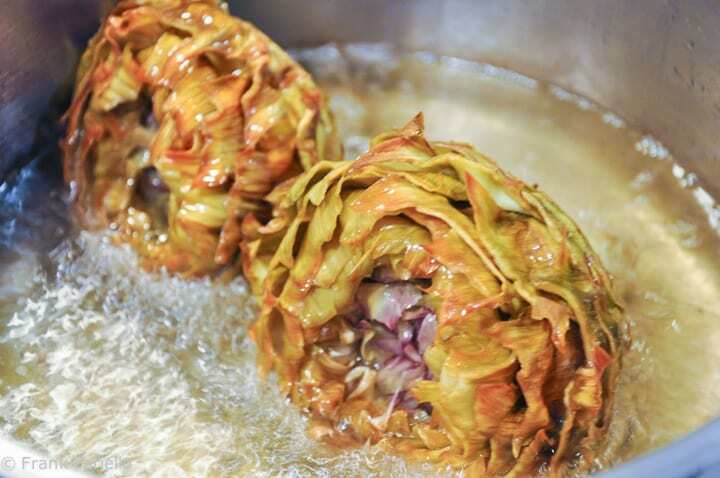 The first frying takes place earlier in the day, and lasts for about 12 to 20 minutes, depending on the size, tenderness, and type of artichoke used. They are then drained, and left to cool. Then, just before serving them, the artichokes are place back in boiling hot oil, the leaves get very crispy and crunchy. Sora Margherita uses a slightly smaller fryer, with a higher temp oil, so theirs are super crisp. Thanks for stopping by, Elizabeth! That seems like a very practical way to make them in a restaurant—or indeed, to make them ahead for company. I looked for these all over Rome (especially in the Ghetto) last summer but alas they were not in season and no one had them. It’s still on my list – and now looking at those artichokes meeting the oil – I feel like I need to embrace these. Dear Claudia, I am sure you’ll love them! hi! in 2010 my restaurant “nonna betta” was already open but you did miss it. anthony bourdain did not… 🙂 see you soon in rome. Many thanks, folks, for all the wonderful comments! Do try this recipe when you have the chance–if the artichokes are fresh and tender, they'll be delicious made this way. @Browsing, Yes, Sor Margherita is a great restaurant! Also love Al pompiere, Piperno and, even if it is very touristy, Giggetto. @Gabriela: What a coincidence! La Torricella was one of my favorite places to eat when I was living in Rome! I even mention it in my recent post on seppioline alla griglia, which was one of my favorite things to order there… Great memories! There's this very local restaurant in Testaccio, a neighborhood in Rome, called la Torricella. It serves the most delicious Carciofi alla giudia I've ever had. Unfortunatelly, the artichoke season doesn't last all year!! Everything else in the restaurant is DE-licious, by the way!!! Carciofi alla Giudia is so good. One of my favorite places in the Ghetto is Sora Margherita. Wow, really falling in love with artichokes at the mo. Cant have pizza without them on. Just need to be brave enough and prepare some by following your post. fingers crossed! This sounds like a great way to prepare artichokes. I'd love to try it! Oh these are one of my favorite things to eat in Rome. But you're right, here in the states, you just don't find them on restaurant menus. But they have so many more varieties of artichokes in Italy than we have here. I once tried to make these, but the artichokes were just tough – not crispy like they should have been. Yours look dynamite! Okay … I HAVE to have this. Seriously.